The circle is a place to reconnect with ourselves, our essence, depth and the magic of sisterhood. For growth, for healing, for nourishment and community. For a different kind of sisterhood.. A place to connect to the magic of the divine feminine (in both its assertive and gentle aspects). To the moon, the magic of our cycle, the wisdom of our bodies. 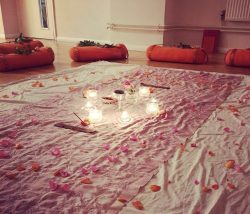 There will be rose petals, beautiful smells, gentle music and the practices include different forms of meditation, conscious touch, silence, dance, creative writing and inquiry. While I, Tanmaya, lead the circle, each woman contributes to the circe through her presence. The healing and growth happens through the circle and the presence we offer each other. My role is to hold that space and prepare it. The open circle’s are there for you to explore and connect with the energy, the space, the women and the practices..seeing if this calls you and serves you..
For those interested to make this a more recurrent practice there will be an option to join the SPRING/SUMMER cycle of Womens circles. So that’s a short summary…you can find out more either by talking to me tanmaya@tanmayageorge.com or on www.risinginsisterhood.com.